Along the way, Pro-Ject Audio has managed to get some quite impressive functions into small spaces in its Box Audio series of components. 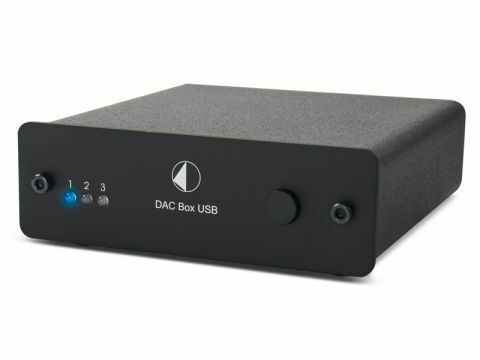 A DAC – even a three-input one – is not quite such a shoehorn feat and, indeed, this is by no means the smallest on the market. It's stoutly made, with a steel sleeve over a steel tray which houses the electronics assemblies. The component count is low, with a DAC chip, an S/PDIF receiver and a USB receiver, plus a minimum of housekeeping parts and a handful of power supply components. Power is from the usual switch-mode wall-wart, though we note this supplies nine volts, suggesting that the dedicated tweaker could easily substitute a nine-volt battery, which might be an interesting experiment. The DAC chip is one we've seen before in Pro-Ject units. It's a handy choice because it can feed the output sockets directly, but it does limit output voltage and the DAC Box only produces one-volt full-scale output. That's only a problem in that you'll need your amp's volume control set a little higher than usual, conceivably leading to alarmingly loud noises when you switch to another source without adjusting volume. Not really a big deal. Possibly more worrying is the issue of limited noise performance from low-output devices. That doesn't seem to be a major issue here, though noise performance isn't quite state-of-the-art: however, there is a little modulation noise in evidence. Operation is perfectly straightforward, with the one button on the front cycling round the three inputs. USB operation is absolutely fine. As with most current DACs, it's limited to 48kHz maximum sampling rate. Pro-Ject makes a point of this DAC being able to extract bit-perfect audio from your computer if you install ASIO drivers, available from the Pro-Ject website. That's true, though it happens to be true for all USB DACs. But credit to the company for pointing it out. It's almost certainly the biggest performance upgrade you can make to a computer audio system for no money! We hooked this DAC up first of all to a laptop computer and played a few files (all uncompressed WAV, naturally) through it. Not entirely surprisingly, given the technical similarity, we found its sound quite like that of the CD Box. That's not a bad thing at all, as the most obvious characteristic of both units is a lively, energetic nature which gets cheerfully involved with any kind of music. There's also plenty of detail around. We'd be lying if we said the DAC is ultra-precise (and it would be unfair to demand it at this price), but it does recover a lot of information from any recording. It's just that it doesn't always present that information in an orderly fashion compared with more upmarket DACs. Still, that seems like an acceptable compromise and we found ourselves easily falling for the unit's general enthusiasm. Tonally, the upper reaches of the bass register seem a shade plummy, while the deepest bass lacks a little insight. There's some decent kick and also tuning to it, though, so again the drawback is hardly noticeable. Midrange very slightly favours male over female voices, while treble is extended, if occasionally a touch dry. And imaging, as you've probably already guessed, is decent but not super-precise – it has a nice depth to it, though. We probably wouldn't get too excited about using this DAC as an upgrade for any CD player of recent vintage. Hooked up to a computer-based source, though, it makes a good deal of sense in the best traditions of fun-lovin' budget audio and in that case the S/PDIF inputs could be handy now and then. All-in-all, another useful Box!